The Morrill Acts funded educational institutions by granting federally controlled land to the states for them to sell, to raise funds, to establish and endow "land-grant" colleges. The mission of these institutions as set forth in the 1862 Act is to focus on the teaching of practical agriculture, science, military science, and engineering (though "without excluding... classical studies"), as a response to the industrial revolution and changing social class. This mission was in contrast to the historic practice of higher education to focus on a liberal arts curriculum. 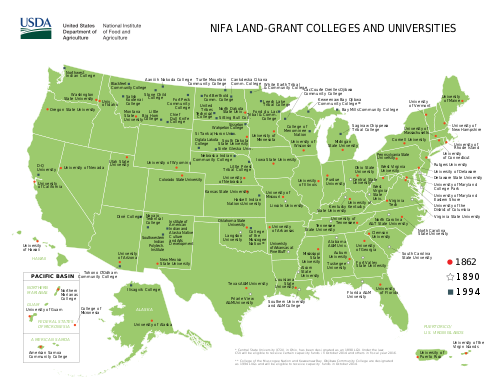 A 1994 expansion gave land grant status to several tribal colleges and universities. The concept of publicly funded agricultural and technical educational institutions first rose to national attention through the efforts of Jonathan Baldwin Turner in the late 1840s. The first land-grant bill was introduced in Congress by Representative Justin Smith Morrill of Vermont in 1857. The bill passed in 1859, but was vetoed by President James Buchanan. Morrill resubmitted his bill in 1861, and it was ultimately enacted into law in 1862. A second Morrill Act was passed in 1890, aimed at the former Confederate states. This act required each state to show that race was not an admissions criterion, or else to designate a separate land-grant institution for persons of color. Among the seventy colleges and universities which eventually evolved from the Morrill Acts are several of today's historically black colleges and universities. Though the 1890 Act granted cash instead of land, it granted colleges under that act the same legal standing as the 1862 Act colleges; hence the term "land-grant college" properly applies to both groups. Older state universities – such as the University of Georgia, which was established with a grant of land in 1784 – were also funded through the use of state land grants. Indeed, land grants to educational institutions are a practice inherited from Europe, and are traceable all the way back to the societies of classical antiquity. These earlier examples, however, offered a different "mission" than the practical education offered by land-grant institutions established under the Morrill Act (or the Michigan legislature). The University of the District of Columbia received land-grant status in 1967 and a $7.24 million endowment ( USD) in lieu of a land grant. In a 1972 Special Education Amendment, American Samoa, Guam, Micronesia, Northern Marianas, and the Virgin Islands each received $3 million.